One of the weekend getaways to try in the Philippines is the visit to the province of Surigao del Sur in the island of Mindanao. This province takes pride of their fast-becoming popular natural spots – one in the town of Hinatuan and the other, in the city of Bislig. You may start your weekend journey by hopping on a plane bound for Butuan City or take an overnight boat ride for Nasipit, Agusan del Norte. 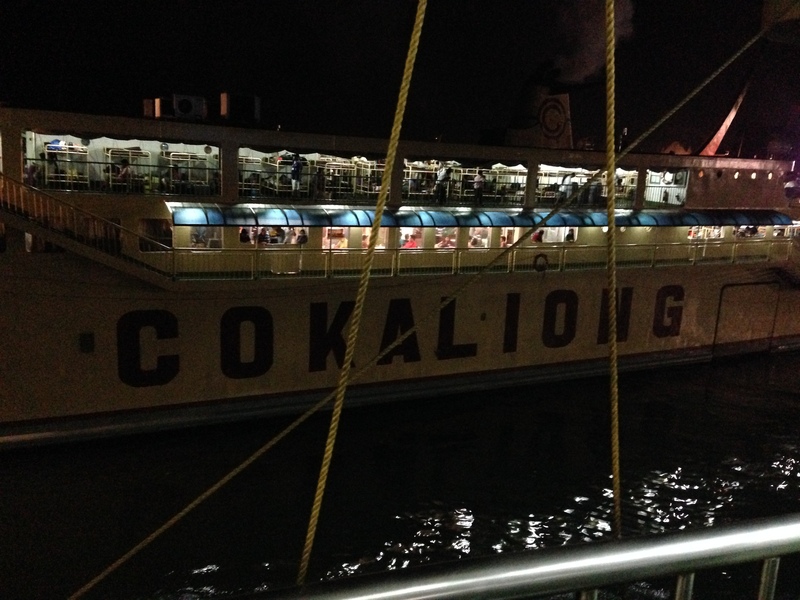 Since I was not in a hurry and because this was a bit spontaneous, I chose to take on a Cokaliong ferry from Cebu. It was an overnight trip crossing the Bohol Sea, arriving at the port of Nasipit at dawn. From the port, you may either take a trike or a jeepney to bring you to the Nasipit bus terminal. At the terminal, take the bus with the Mangagoy signboard. 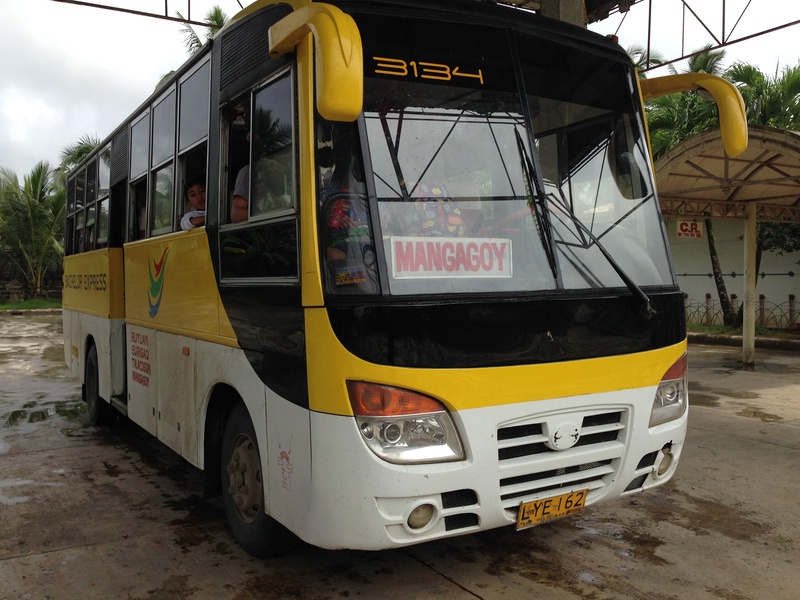 Most of the buses and vans use Mangagoy instead of Bislig. Don’t confuse yourself. Mangagoy is the commercial section of Bislig City and is located at the farthest section of the city (close to the paper mill complex) and is where the transport terminal of buses and vans is. Bislig may refer to the city center where the government offices and administrative building are situated. You will pass by Bislig before you reached Mangagoy. For those who will opt to fly-in to Butuan, from the Bancasi Airport, head directly to Butuan’s bus terminal and catch a bus to take you to Mangagoy. Travel time to Bislig is at least five (5) hours. I got on a regular bus going to Mangagoy. It left Nasipit a bit over 6am and headed to Surigao del Sur. From Nasipit, it passed through Butuan City, Bayugan and San Francisco town in Agusan del Sur where the requisite stop was done for passengers to have a quick brunch, toilet break or cigarette puff. 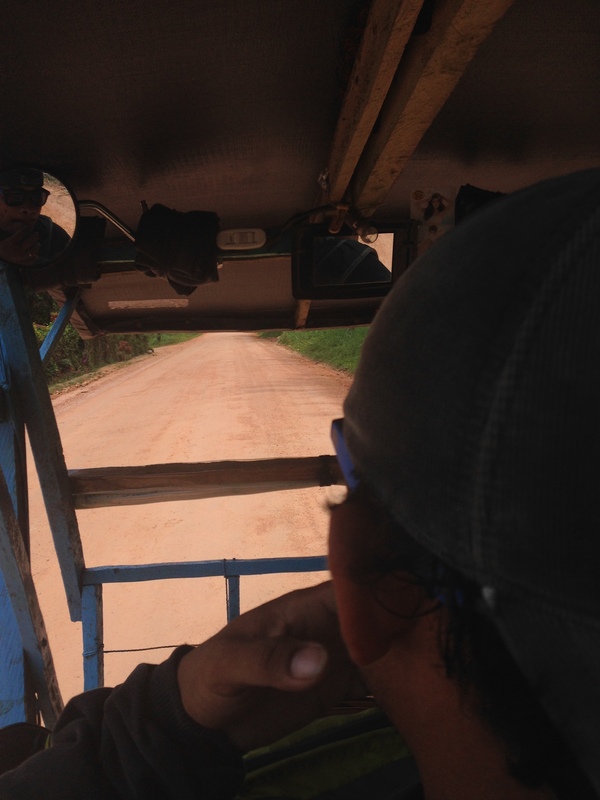 From San Francisco, the bus then took the east road heading to the towns of Barobo, Tagbina and Hinatuan. 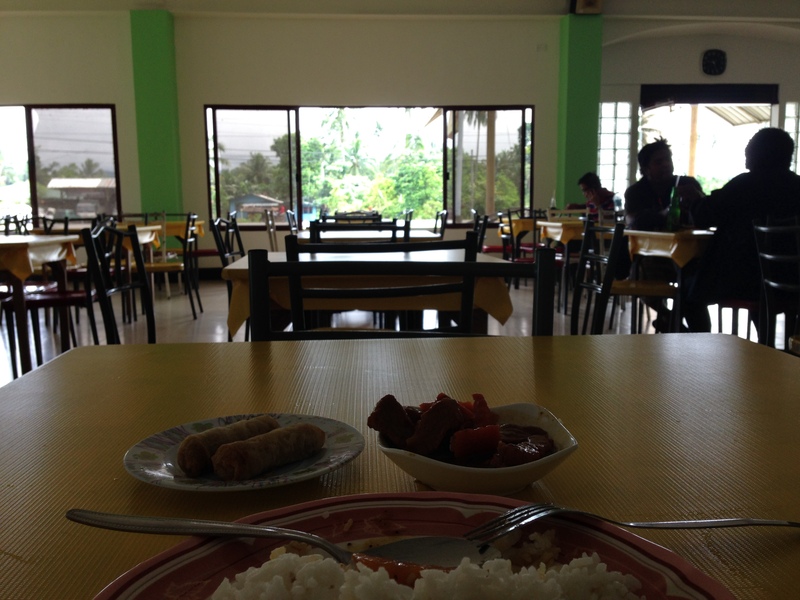 The bus made a quick stop at Hinatuan terminal. 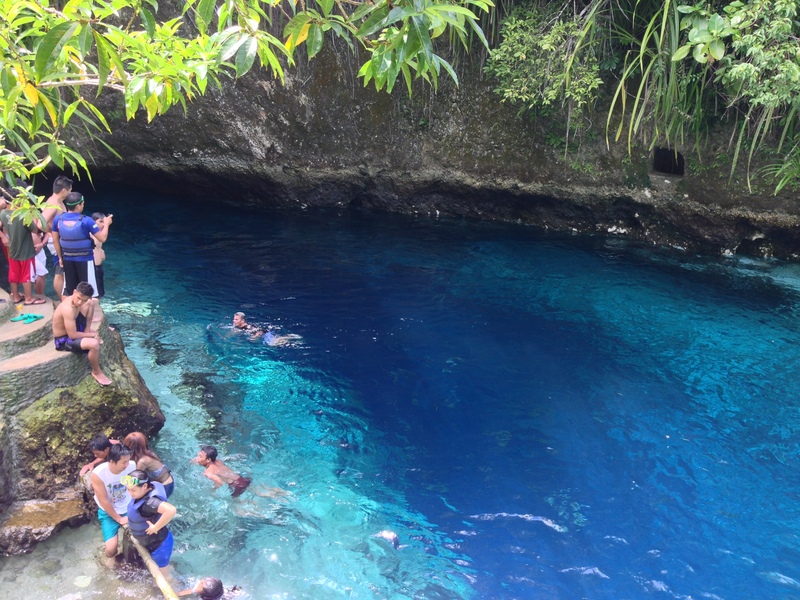 I stepped of the bus, and decided to visit the Enchanted River first before going to Bislig later in the day. At the bus terminal, it’s not difficult to find a ride that would take you to the said popular spot. There are plenty of ‘habal-habal’ drivers that can bring you to Barangay Talisay for an agreed price. Most of these motorbike drivers belong to an organization of drivers and had received training as tour guides from the local arm of the Department of Tourism. 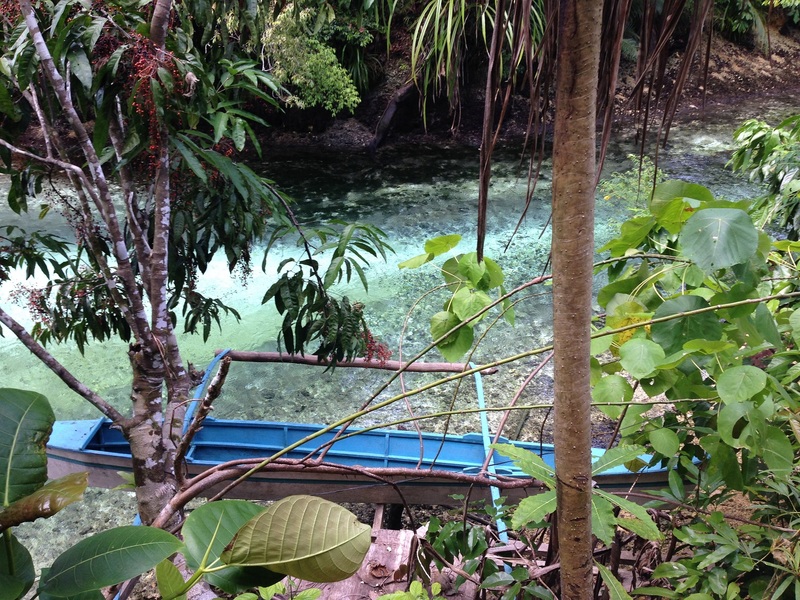 The standard price is Php 200 (April 2014) return trip from Hinatuan town proper to the Enchanted River. It is recommended that you take the habal-habal since the road from the junction to Barangay Talisay is not good. The trip took at least 30 minutes. Manong driver asked me if I’m going to Tinuy-an Falls after. He said that that they could actually bundle the two spots in one day. I thought about visiting the falls early the next day so I could catch the rainbow display in front of Tinuy-an, so I just opted for the Enchanted River for the day. Finally, I reached the spot. 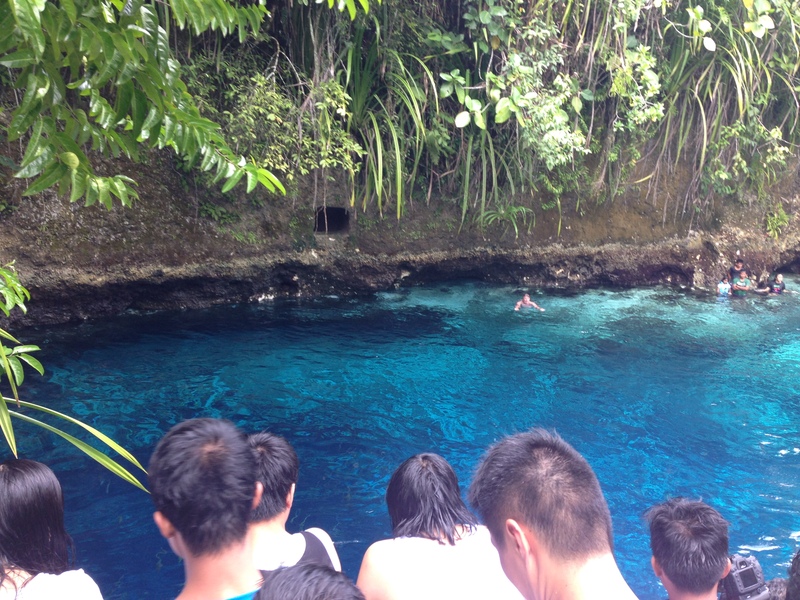 Hinatuan Enchanted River. This spot is like a huge swimming hole with various shades of blue, the darkest part is in the middle, believed to be deep and unfathomable. 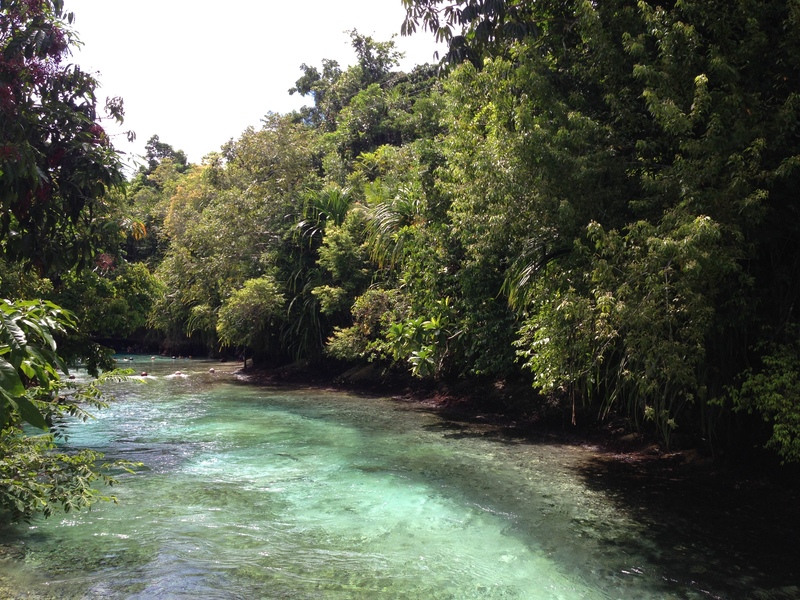 It is also like a spring, where the river starts and flows at a distance, emptying into the Hinatuan Bay. You have to pay an entrance fee of Php 30. Life jackets are also available for rent. Cottages can also be rented. 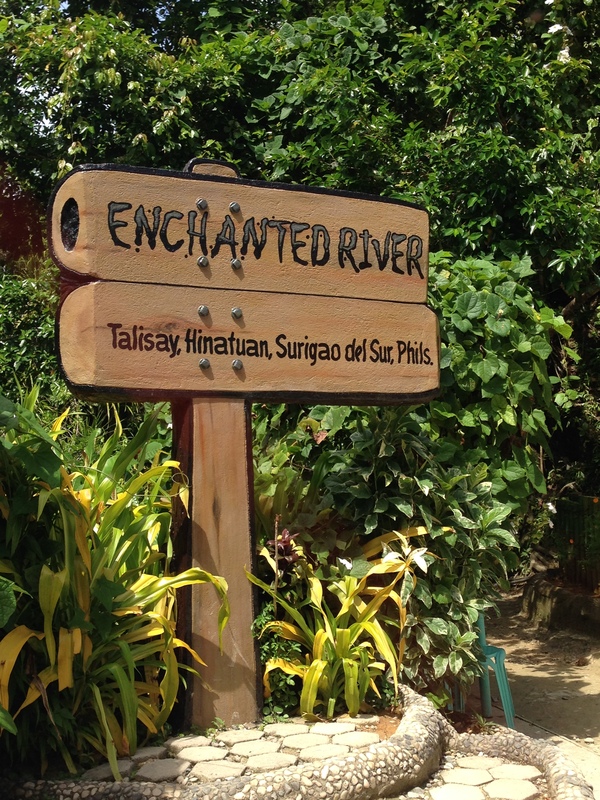 Try as much to reach the Enchanted River before 12 noon. A scheduled feeding time at 12nn and 4pm should not be missed. It is fascinating to know that when the bell is rung or the instrumental music is played, school of fish began to surface from the water but when the feeding time is over, they seem to disappear in sync with the music or as soon as the music began to fade. While there may be tales and unverified stories or hard-to-believe statement about the Hinatuan Enchanting River, this spot, on the basis of its visible beauty alone, has a charm like no other. The visit and travel to this enchanting water is not to be missed at all. I spent a couple of hours in the place. The spot could get crowded on a weekend. Having visited it on a Friday of April, people come in droves or in buses and made it as their weekend summer get-away. After the visual feast of the Enchanted River, I headed back to Hinatuan town proper and waited for the bus that will take me to Mangagoy, Bislig City.